Hidden in the Southern portion of the extensive Kwando wilderness of 232,000 ha. (550,000 acres) is Lebala Camp. Lebala is situated in the South of the Kwando Reserve, adjacent to the head waters of the Linyanti marshes that form the boundary between Botswana and Namibia. The perennial and southerly flowing Kwando River disappears into the vast marshes before emerging as the Linyanti River flowing in a north easterly direction. Lebala is the Tswana word for wide-open plains, and each tent has extensive views over expansive tracts of African plains and wetlands that comprise part of the Kwando-Linyanti flood plain system. This system is an intricate labyrinth of waterways, reed beds, islands, floodplains, bush, scrub and trees. To those in the know - somewhat Okavango like but something different too. This wild expanse is contrasted with the casual understated elegance and luxury of the camp itself. Lebala Camp is owned and operated by Kwando Safaris. The camp is open year round. 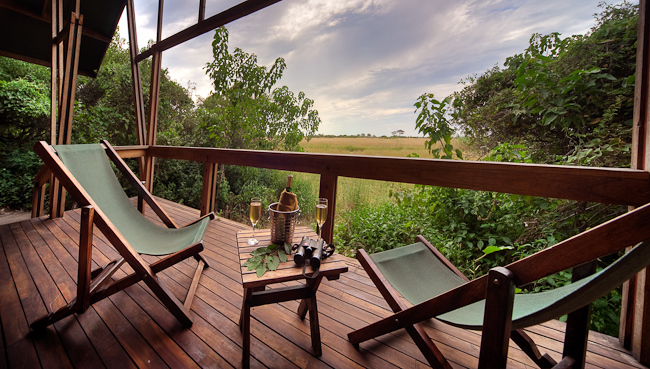 Lebala Camp comprises 16 beds in 8 luxuriously spacious tents, on Zimbabwe teak decks. Each tent is surrounded by spectacular shade cloth walls, with a variety of curtains and shades so you can decide on how much light you let in or not. Sliding doors and a spacious bedroom area, bathroom including a Victorian claw bathtub, double basins, outside double showers, separate toilet and fans. The teak furniture created for us by Zimbabwean master craftsmen is elegant, comfortable and simple, leaving the tent looking spacious and tasteful. The clean simple lines created by the shade cloth, and variety of curtains, will complete the picture of privacy and space. The shade cloth walls allow you to view the sunrises and sunsets from the safety of your rooms whilst also viewing the elephant's and hippo's walking past your room in the light of the full moon. At Lebala Camp, the activities concentrate on open vehicle game drives and waling safaris. However, game walks are at the guides' discretion due to the concentrations of Elephant. Lebala Camp offers off road and night game drives - night drives being a specialty at Lebala with its high-visibility plains. Walking in Africa's wild areas is the only way to truly appreciate the natural environment. While game viewing from a vehicle allows one to see more animals as you traverse much greater distances and get much closer to animals safely, there is nothing as awe inspiring and humbling as observing wild animals on foot. Many smaller species of plants and insects, tracks and signs are all easily missed when in a vehicle. The slow pace of the walk and interpretative skills of your guide will open your eyes to a new and fascinating world. Lebala is famous for its Elephant sightings as is neighbouring Lagoon Camp, located 35 kilometres to the north. In fact, the Kwando Reserve is home to more Elephant than the entire country of South Africa. There are good numbers of Impala, Kudu, Zebra, Wildebeest, Tsessebe, Giraffe, Sitatunga, Sable, Roan, Buffalo, Bushbuck and the smaller antelope. Kwando also provides refuge to Red Lechwe, Waterbuck, Warthog and the shy Sitatunga Antelope. In fact, Lebala has been delivering very reliable Sitatunga sightings for a year now (just near the airstrip). The major predators such as Lion, Leopard, Cheetah, Wild Dog and Hyena are resident and regularly sighted. The reed and papyrus swamps are ideal for the numerous and diverse species of birds. Night drives allow guests a chance to see the nocturnal species such as Civet, Large- and Small-spotted Genet, Honey Badger, and Spring Hare. Nocturnal birding, especially Owls, is also excellent here. Both camps (Lebala & Lagoon) deliver the specials like Aardwolf, Aardvark, Ratel, Serval, Caracal and Selous Mongoose quite regularly.